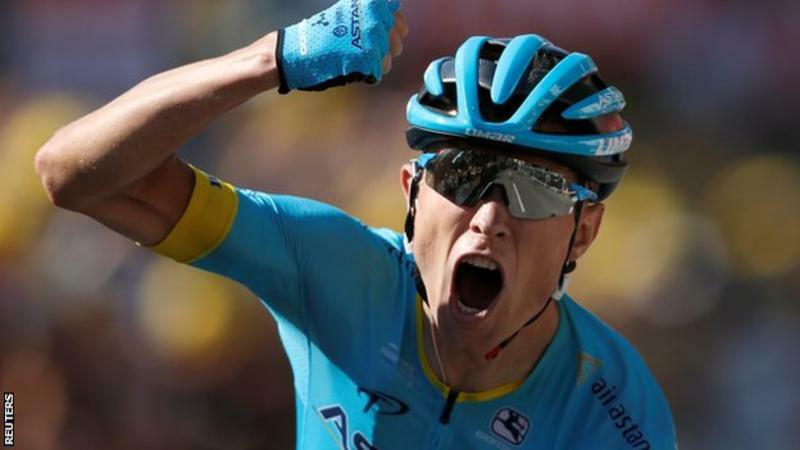 Magnus Cort Nielsen won stage 15 of the Tour de France on Sunday after dominating a three-man sprint finish. The Astana rider proved too strong for Jon Izagirre of Bahrain-Merida and Bauke Mollema of Trek-Segafredo to take the 181.5-kilometre stage from Millau to Carcassone. ‘It’s amazing, something I’ve been dreaming of,’ said the 25-year-old Dane. ‘This is my first year here on the Tour and I’m so happy to take my first victory. Mollema praised Cort for the win. ‘He’s really fast, and it was a tactical final. We worked well together [to chase Rafał Majka], that went really well, then everybody was looking at each other… a bit of a game with 10km to go. Welshman Geraint Thomas crossed the line with the peloton 13 seconds later to retain the yellow jersey. Thomas continues to lead defending champion and Team Sky teammate Chris Froome by one minute and 39 seconds, with Team Sunweb’s Tom Dumoulin a further 11 seconds back.